A story for Christmastime. One for reading aloud. Father Christmas, Saint Nicholas, Santa Claus… Call him what you will, he is older than those names; older than the religion of the Christ Child; older, even, than the pagan faiths that gave us the high feast of Yule. The protector of children in mid-winter, that cruellest and most dangerous time of year: the time of the gnawing hunger and killing cold, the time of darkness and of famished wild beasts, grown desperate by that same hunger and cold. His appearance – the fat, jolly, old man with the red suit, the kind, saintly bishop, whatever image you have of him – is shaped by our imaginings, although he is happy to adopt it as his own. Forget all the trappings and trimmings: chimneys and reindeer-drawn sleighs are not required; sacks, stockings, ‘Ho! Ho! Ho!’s are unnecessary. But still he comes to every child, everywhere, at midnight, on the very brink of Christmas, and to every child he gives just one special gift. To every child: whether they know of him or not, whether they believe in him or not, whether (but don’t let them know this) they have been good or not. They won’t see him, even if they stay awake, but he will still come. Whether the child is rich or poor, sick or well, happy or sad. All children, everywhere. He will be there with his gift. That is his duty of care. There may be presents waiting in the morning. Things lovingly made by hand, things bought out of duty and expectation, things hoped for and things unexpected. They didn’t come from him. His present is invisible, but it is always there, whether or not there are any others. Just one very special gift: a wonderful idea, a new awareness, a feeling of being loved, a sudden hope, a burst of joy, a comforting thought, a moment of peace or a great and glorious dream – whatever it is, it is chosen very carefully, and given with kindness and love. All things have their opposites. While Father Christmas is familiar to many, there is another visitor known only to the few. Not a fat, jolly, old man, this spirit, but a slender woman. The Antisanta is as timeless, as ancient as the Santa, but she appears to be young. 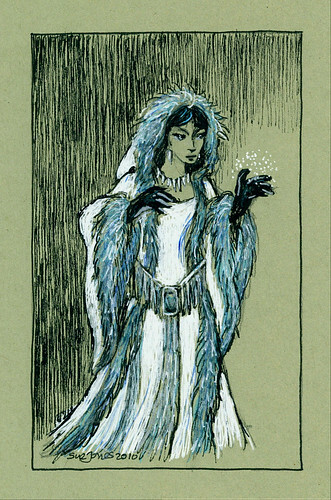 She is beautiful, but with a cold, forbidding beauty: her face never softened by a smile, her hair night-dark, her robe of white trimmed with the blue of moonlit snow. Perhaps old stories of ice-queens and cruel stepmothers have shaped her, or perhaps they merely reflect her. Mirror, mirror…. To contrast with a visitor at midnight in mid-winter, you might expect the Antisanta to come in daylight, and in mid-summer. But nature is not so tidy and the lady in white is neither so punctual nor so predictable. But she will come, be sure of it. She does not come to children. She comes only to adults. And she will come to you. Sometime in-between the coming of Christmas Day and the ending of the Twelfth Night she will arrive, invisible. The Antisanta does not bring gifts. She takes. She will take something, just one thing, from every adult in the world. Whether they know of her or not, whether they believe in her or not. That is her duty of care. She will take one thing: a failed idea, a lost awareness, a love grown cold, a growing fear, a burst of anger, a sad thought, a nagging worry or a dreaded nightmare. She will take just one of these things away from you, and then she will leave. And suddenly, looking around, you will know (without knowing how you know or why you know) that the balance of the year is restored, that the heart of Christmas is over. And you will realise that you have, for all your doubts and forebodings, survived it once again. You will realise that the new year is on its way, that life goes on. And here you are again: a bit older, but perhaps a bit wiser. Further from your childhood hopes and dreams, but better able to cope with whatever awaits in the real world. And she, the Antisanta, carries away those things, the pale, cold sad things that she has taken from you, from me, from all of us, one from each. She takes them away with her and gives them to her three helpers: the life force of the Springtime, the healing power of the Summer and the bounty of the Autumn. And by the next mid-winter they are changed: made clean and whole and fine; made new and better than new. Ready for another child and for yet another Christmas Eve. Sue, what a lovely idea. What’s your source for this story? I think it’s so clever. In fact your whole blog is so impressive. Thank you. Thank you, Pauline. There was no obvious source for the story. I had been vainly trying to think of something to use in my Christmas letters. And then this arrived in my head one Sunday morning while I was soaking in the bath – both the story and the authorial voice for it. A little while later I was sitting at the keyboard, still slightly damp, trying to catch the best bits before they slipped away. And here it is.